This is one of my everyday playing and gigging guitars. I bought it in 2001 from a chap in Cleveland, Ohio. He was writing articles for a Guitarist Magazine and the National was everything he described, still using it’s original cones and in near perfect condition. It cost me $2,400 and since the day it arrived, it has allowed my playing to move into another dimension. The National is full of presence, dynamics and over tones and is under my fingers most days. A few years ago I fitted a Higlander magnophonic pickup under the bridge, which providesa sound close to the acoustic qualities and usually needs little Eq. The jack input is mounted on a small plate by the grill; I wouldn’t be drilling any holes in the body of this beautiful old guitar. This is made completely in Koa and bears a Hawaiian Stamp and the makers name Tabu. The inner label has the name of a musician who recorded in the 20’s: Paul F Summers. I have made enquiries and people have seen ukuleles with his name but so far no guitars. I have owned this guitar for about 15 years. It was discovered locally still with its original case, a raised nut some music and an old bar slide. It is in great condition but the top, which is only about 1mm thick, has warped in front of the bridge. It has a deep, rich sound and a fair volume. I keep in tuned down to open F.
1920’s French/Italian? Converted parlour guitar. This guitar was hanging on the wall of a collector from Derby. He had bought it in the 1960’s from a doctor for 10 bob. (£0.50)! At some time during its life, the original neck had been shared mid way along its length and a new one professionally scarfed on. At the same time (I guess 1950’s) the instrument was converted for Hawaiian playing, being fitted with a tailpiece, raised action and only onlay in what used to be frets. The standard of workmanship on both the original guitar and the work in converting are excellent and it sounds really loud for it’s size and has good sustain and tone. It isn’t easy to play, as the neck length is equivalent to 13 frets at the body. It takes a bit of getting used to! I added it to my collection around 1999. These guitars were made by the highest quality artisans of recent times. This is an extremely sought after guitar and this one is in fantastic condition. The style was the top of the range model with the rare addition of coloured buttons. High quality plastic body with smoothe curves for easier playing. Sweet melodic tones are always achieved regardless of guitar playing ability and is an essential addition to any serious collection and was definitely well worth my long and eager search. Although not played as often as I would like it is always a treat for both myself and my audience when this fine instrument is removed from it’s carrier bag for special gigs and personal performances. l bought this instrument in October 2003 through Ebay. It had been traded by a collector/dealer in Essex,England and caught my interest. 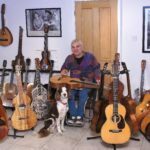 It is a fascinating guitar with some very unusual features like an extra set of sound holes, drilled into a well at the back of the bridge and a wide body. It uses bone tuners and a slotted headstock. l carried out a few repairs and set about trying to trace its history, with limited success. Through part of a broken shipping label with half a name and address on it, I discovered that the guitar had traveled on the P. & O. Steamship Comorin, which was built in Glasgow in 1925 and was used for passenger service to Australia and the USA. The owner at that time was a Mr. Walter Darby; a reference to his name was on the shipping label. Through the Guildhall library in London, I discovered that he had lived in Sevenoaks, Kent, from 1921 to 1938 when he died. Perhaps he was a gigging musician who traveled abroad for a tour. Despite trying to find further details of any descendants through the local Kent press, l have been unable to unearth anything further. 1988 Dobro (by Gibson) No. 18121. My first Resonator Square Neck Guitar, the instrument I started to develop my slide playing skills with. This was bought new and has seen some wear. It is strong and lucky, having been thrown out of the back of my car in 2000 when I was involved in an accident on the motorway. The case flew open and despite flying through the air, the guitar survived with minimum damage and was quite easily repaired. 1973 Yamaha FG260 No. 38817302 12 String. I bought this new in 1973 from a guitar shop in Manchester. I think it was about £80.00 then. It is the Martin copy with the spruce top and rosewood sides and has that big sound. Lovely. I used it back then for folk music and enjoyed finger picking with gusto. Around 1980 when I started thinking about playing again, I played it with 6 strings. Now it’s back to 12 strings with a raised nut, which I’ve had specially made in brass. On my first CD, The Bell, you can hear this big sound on the opening track, Banty Rooster. This is an original American Regal wooden square neck lap model. It looks pretty bonkers but reflects a fashion – made of solid birch, it is painted in an absolutely beautiful herringbone pattern. l believe these ‘things’ are highly collectible, but l bought it for novelty value. It sounds pretty good considering the crack down the back. Good sustain but a thin sound. The top has warped around the sound hole but as its made for lap playing it makes no difference really. To add to the beginners feel, the frets are numbered. The green Regal logo dates this instrument to no later than the 30’s. and it is completely original including tuners. This guitar was brought from Massachusetts and is one of the several Weissenborn’s originally sold and distributed by the Henry Stadlmair Company of New Jersey. l dated it accurately using the Knutsen book through the shape of the bridge and bridge pins. It is all Koa and completely original. The shellac finish has those aged crazing marks that show up in the light and the instrument still has its original tuners. It has some dings and scratches where picks and bars have marked the surface, but it is structurally sound. Speaking of sound: it has a sharp top end from the Koa and a warm bass but without any booming sound. The resonance and sustain has improved as l have played it and l guess that prior to it reaching my hands, it has been languishing in someone’s loft for years. Inside the original flimsy wooden case was a steel bar and a book: ‘Steel Guitar (Hawaiian Method) and How to play it’ by Leon Coleman. I guess the book is also about 1925 and was originally 75 cents. A fascinating book but sadly, the mouse which lived inside, has eaten some of the best notes and some of the best songs. 1920’s Hilo Hawaiian lap guitar, serial No 8031. At the time, the Hilo was an inexpensive alternative to the Weissenbourn. At $38 rather than $44 that is! The Hilo has a much deeper body and is made of mahogany so it has a brighter tone than the koa wood weissenbourn. l like the slotted headstock too, which I find easier to work with than the flat one, and the lovely shape of the heel. This particular guitar has had a new bridge fitted, but it exactly matches the original and its been professionally done. It gets played every week or so, and retains a rich, deep sound. The Kona Hawaiian guitar was built in small numbers – about 1000 in 20 years of production. They are rare nowadays. The majority of these instruments were built by Weissenbourn as was this model. lts a style 3 from the mid 1920’s and can be traced in the ‘Knutsen’ book by Noe and most. This is a beautiful instrument which is in almost new condition. lt sounds just fantastic – rich bass with warm tones and very LOUD. l have the original hard shell case and bar, even original strings – it has a set of D’Addario at the moment. This guitar was owned by someone called Ralph Voecks, (his name is painted on the case, and pencilled inside the guitar) who didn’t play it much but lived and died in Nebraska. Feb 2003 Bear Creek A/C Cona Hawaiian Lap Guitar. l feel very humbled and yet fortunate to know some great musicians like Bob Brozman and Woody Mann. ln 2001, Bob played a gig in my locality. We knew each other from my involvement with IGS and he let me try his Bear Creek Cona Rocket guitar. l was moved by the sound, and by the experience of this moment. Bob’s perception of this and his generosity ‘kicked in’. Upon his return home, he set up a fund raising idea and through the IGS alumni, raised a significant amount of money towards the cost of this guitar. Needless to say, it is my most treasured instrument but it is used all the time, for fun, gigs and recording. When people see and hear this guitar, they recognise its quality, both in sound and aestetically. The guitar looks and sounds amazing with clear note separation and depth with masses of sustain. My playing skills don’t do it justice and they never will, but it is such a pleasure to own and play this guitar. In 2006, I was offered a gig in London, Ontario at a weekend festival there. A brilliant gig. Anyway, through a perusal of Ebay and with the help of my friend Phil Floyd, who lives in Canada, I bought this guitar, which was already Canadian… and played it for the first time in the festival. It is in fabulous original condition and sounds just like it should, with good bass and a full mid range with all those Tri Cone overtones I like. My name is Jeanette Brue and my mom’s name is Fran Brue. On Apr.28, 2006, through our friend Colin Stevens of Mission B.C., you purchased my mother’s 1929 National Hawaiian Steel Resonophonic Tricone guitar. Included with the purchase were several Hawaiian guitar music books, picks and a steel bar. All these items mom used. Colin forwarded your e-mail regarding information about the guitar as you are going to put it on your website. I’ve been planning for some time on getting in touch with you as mom and I were wondering how you liked the guitar. Mom loved the instrument and is glad that you are enjoying it. She will be delighted to see it on your website. It hurt her to part with it. She’s happy that it found a good home. Mom bought the guitar second hand about 1936 in Vancouver B.C. for around $80.00. She took lessons while living there at that time. In 1941 dad joined the British Columbia Provincial Police and mom, dad and my sister were stationed in Richmond (an island suburb of Vancouver). In 1944, they were transferred to Prince Rupert, a town on the northwest coast of B.C. Mom started teaching the guitar there. In 1947, after I was born, dad was transferred to Terrace B.C., a town about 100 miles east of Prince Rupert. He was in charge of the detachment there. In 1950 the Royal Canadian Mounted police took over the B.C. Police so dad became a member of the R.C.M.P While in Terrace, mom taught both the guitar and piano and performed on stage playing the guitar. She was a very busy person looking after her family, being a police matron, cooking for prisoners, sewing, knitting, crocheting, being secretary of the Sunday school. She also started teaching me the piano when I was 4 years old. I don`t know how she managed to do so much! In 1954, dad was transferred to Langley, a town about 30 miles east of Vancouver. He was in charge of the detachment there also. While in Langley, there weren`t many students taking guitar lessons so she became more involved with teaching piano. Also the Hawaiian guitar became less popular at that time and never recovered it’s popularity here. In 1961, dad was transferred to Brandon, Manitoba and in 1963 transferred to Winnipeg Manitoba. In 1969 dad retired from the R.C.M.P and we moved back to Richmond. The guitar was always kept in it’s original case which you now have, and always carefully stored whenever it was not in use. After Terrace, mom rarely played it as she was so busy teaching piano wherever we lived. As you can see, that guitar travelled alot of miles before you purchased it. We never dreamed that it would travel all the way to England. Dad passed away in 1997. They were married 63 years. Mom and I live together. She will be 93 years old on Apr.19. We have been in the process of downsizing and no one else in the family played the guitar. Again, we are delighted that you are enjoying the guitar. Mom took good care of it all through the years and we had never seen another one like it. We look forward to seeing it on your website. Mom sends her regards. Apparently, Stromberg were the predecessor to Kay… The net tells me this is a Stromberg yet there are references to an exact model in the ‘Knutsen’ book as a Regal/Bruno/Weymann guitar. So its a who knows what it is… No makers name or a stamp anywhere. lts well made of mahogany and has a part stencilled, part painted Hawaiian theme on the front. The bridge needing re gluing but it is in great condition right down to the mother of toilet seat pick guard and fingerboard. These guitars were made by Schireson Brothers in Los Angeles during the 20’S and 30’s. ln a section of L.A. in 1910, worked the luthiers Weissenbourn, Schireson, Knutsen and the De Lano brothers. The Lyric is an extremely rare guitar and this one is in fantastic condition. The style 4 was the top of the range model with an inlaid rosette and spruce top, mahogany back and sides. The cellulose biding had shrunk with age but l have managed to get this re glued in place. Apart from that the guitar has nothing but a few tiny blemishes and scratches. A truly wonderful find, it came with original tan canvas case and strings! It sounds really good too, with a strong deep tone and plenty of string separation. lt plays well but like all of my old, treasured guitars, I keep it tuned down a tone. I hope that Nathan and Jacob Schireson would smile to see it still here, still sounding great and still held together. Incidentally, there is, as often with quality instruments, The Lyric has been copied. A Mexican built Superior is almost an exact copy. They were commissioned by the Berkley Music Co. of California and in my humble opinion, they’re not bad, but the string spacing is far too wide. However, back to the real thing….The Lyric guitar is very similar to the Hilo in size and construction, but is of much better quality and uses superior woods. 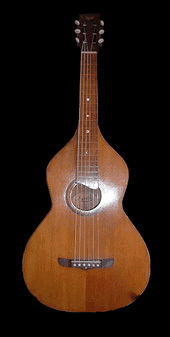 Research suggest that Schireson’s also made the Hilo guitar when demand was high although the Oscar Schmit company distributed them. I have found a new guitar, or maybe it found me …. Erich Solomon is known for making beautiful jazz guitars and fine arch tops. He is based in Epping, New Hampshire and has a brother in Alaska who is a great guitarist. Anyway, this guitar came into my hands – it was due to go to one Mr Ben Harper, but l got in there first.